Black Light yoga is a unique uplifting experience. The invigorating environment enhances the physical and most importantly the internal experience. The classes are dark and the music is loud. The play lists is lively and her class style is active and fun. 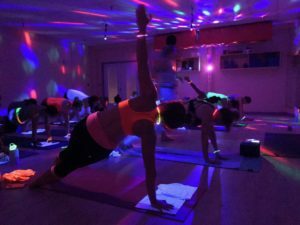 Black Light yoga is more about flowing, regardless of perfect alignment; Flowing into your true self. Come turn inward and be you. No experience needed! Sense of humor is recommended! Wear bright colors that glow, white works too. We’ll have black light accessories to light up the fun.